We use USPS shopping and offer the following methods for domestic and International shipping at checkout. Please note that orders are not shipped on USPS designated holidays. 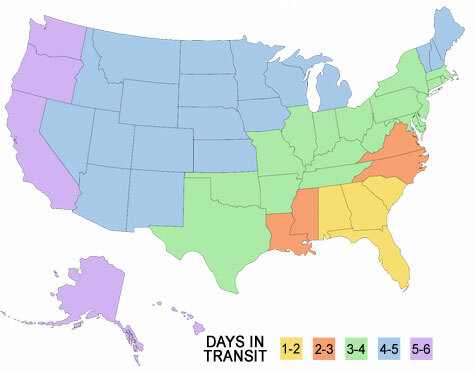 USPS Standard Shipping (1st Class, 2 - 6 day delivery). At a flat rate $4.99 per order, arrives within 2 - 6 business days in the continental US. This is the method used for our Free Shipping offers as well. See map below for approximate transit times. USPS Priority Mail (2-3 day delivery). At a flat rate of $8.99, this method delivers within 2 - 3 business days in the continental US. These orders are trackable, and when shipped, a tracking email will be provided. USPS Express Mail Shipping (Overnight). A flat rate of $23.99, this is our overnight shipping which arrives the next day (weekends and holidays excluded). These orders are trackable, and when shipped, a tracking email will be provided. Note: Some locations cannot be delivered overnight - usually more rural areas that are not located close to a USPS sort facility. Please use the USPS Rate Calculator (select Priority Mail Express) to see if your order can be delivered overnight. First Class International Shipping. Starting at $9.99, rates depend on the country being shipped. We do not offer free International shipping at this time. Delivery ranges from 7 -14 days, depending on your country. USPS 1st Class International shipments are not trackable, therefore, delivery cannot be guaranteed nor refunded for non-receipt. International Priority Mail: Ranges from $12.99 to $29.99, depending on the country being shipped to. It arrives within 7 days. This shipping method is trackable, and when shipped, a tracking email will be provided. Just need a different size? We try to make exchanges easy. Need it Fast? Best thing to do is purchase the size you want on a new order, and return what you have for a refund. Make a note on your return that you ordered a different item on a new order, and we will refund any shipping that you paid for on the new order. Not in a Hurry? If you aren't in a hurry, return your item with a note telling us what you need. You will not be charged for the exchange, so long as the item being returned, and the item being requested are the same price. You will also not be charged for shipping. Please note that some items cannot be returned for exchange, as noted in the "Refunds" section below. Merchandise must be returned in new, unused & unsoiled condition. With exception to custom or made-to-order items, your purchase can be exchanged or returned for any reason up to 30 days after receipt. Sorry, custom ordered or made-to-order products cannot be returned and are non-refundable. Defective merchandise that does not stand up to our 1 year guarantee (see below for details) may be returned for a replacement or refund. Please contact us if you have a defective product for authorization and instructions. Returned Orders with Free Shipping will incur a $4.99 restocking fee (charged only when all items in the order are returned). Shipping costs associated with returning items are not refundable. Order cancellations, if requested prior to an order being shipped, are accepted. There is a $1.00 charge for each order cancelled. All of our products are made by us here in our Florida facility and are available for immediate shipment with exception to custom orders and select harnesses, which are made to order. In-stock* orders received by 11:59PM (EST) MON - FRI are shipped the next business day. Note that orders are not shipped on USPS designated holidays. Custom orders received by 6PM (EST) are put into production the next business day and require 2 - 5 business days for processing. *There are occasions when our in-stock merchandise may sell out during your shopping experience. When this occurs, we will advise you (within 24 hours) of product availability, estimated ship date and order options. Withstand several washes (machine wash delicate cycle, flat (air) dry). Withstand normal, everyday "dog" wear. Our seams are very strong and will not unravel, and our hardware will not break. Our hardware, nylon* and fabrics will not fade (with some exceptions, see below) and our collars will remain durable and functional with proper care. With exception to some types of fabric wear* we guarantee that our collars will last at least a year on the average dog. Our collars, leashes and harnesses are intended for use indoors (unleashed), or for outdoor/travel on your dog. For harnesses and martingales, we advise that they be used on leash only, as dogs can get caught easily in brush and branches when unsupervised. This not only can cause damage to our product, it can put your dog's safety at risk. Anything that occurs to our products while not on your dog voids the guarantee, and is the sole responsibility of the buyer. * Our guarantee does not apply to charms & charm clasps or 3rd party products that do not reflect The Artful Canine trademark. Damage caused by chewing, scratching or biting of product or fabric is non covered under our guarantee. * We cannot guarantee that a fabric or the nylon will not fade if not washed using our recommended care instructions. Note that red & pink nylon has a tendency to fade with exposure to sun, and bleed when exposed to salt and pool water/chemicals. See our Product Care Guide for help keeping your Artful Canine product looking good and lasting long. Fabric/nylon edge fraying may occur on a martingale loop due to the friction caused by constant pulling and tension of the loop. This typically occurs with large, strong dogs that pull non-stop when on leash, and create and continuous friction from the steel loop rings. While we guarantee that the loop and collar will not break, we suggest purchasing a martingale with a chain loop, which is designed for such vigorous use. This "half-check" martingale is perfect for big strong "pullers." Replacement collars will be of the same or comparable style/size as originally purchased.